Abuja, Nigeria. September 06, 2010 –The executive committee of the Nigerian Football Federation (NFF) recently announced that the position of the Super Eagles Coach will be advertised and filled by the 1st of October. Before this, Samson Siasia, who was provisionally appointed as the new Super Eagles coach in July 2010, was in the lead among those who were interested in the position. The previous coach, Lars Lagerback had failed to meet the target given by the NFF, to take the Super Eagles to the semi finals of the South Africa 2010 World Cup. 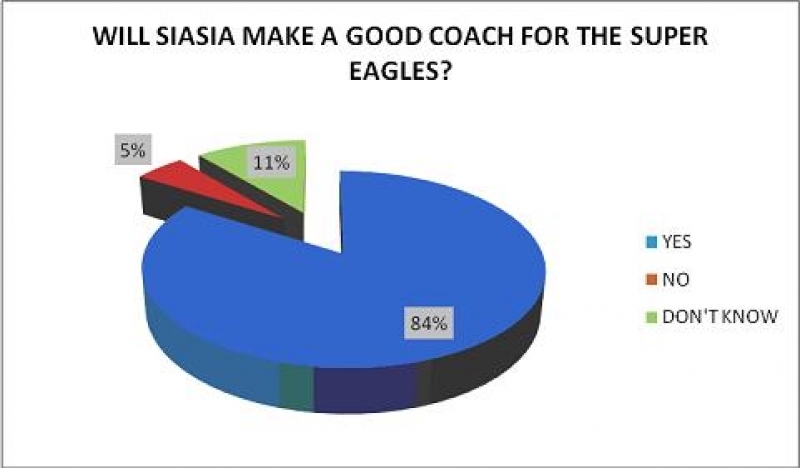 In a recent survey conducted by NOI Polls, Nigerians were asked if they felt Samson Siasia would make a good coach for the Nigerian Super Eagles. Over eight in ten respondents (84%) said he was ideal for the position, while 5% of the respondents said they did not think he would make a good coach for the Super Eagles. 11% however did not know whether or not he would make a good coach for the Super Eagles.